However, this year, all that nonsense has been drowned out by the phenomena that is the Donald Trump presidency; as an avid NFL fan, I welcome the distraction from talk of what Tom Brady eats for breakfast or the sob story of the scrappy player from humble beginnings. Budweiser, the St. Louis brewery that gave us frogs, “Wassup?”, & Helen Mirren’s anti-drunk-driving message, has a 60 second ad premiering on Sunday that has been chastised as being pro-immigration and therefore by proxy “anti-Trump.” The ad titled “Born the Hard Way” documents the arrival of Adolphus Busch in America from Germany. The ad comes complete with a dangerous sea voyage, stitches, nationalistic threats of intimidation, and the feel-good moment where we see “Anheuser” meeting “Busch.” And the rest they say is history. It’s enough to make you want to put on a pink crocheted hat and go march for… something. Instinctively, the immediate reaction was this is somehow some kind of swipe at Trump, his position on immigration, and/or his Muslim ban of refugees from Iran, Iraq, Libya, Syria, Yemen, Somalia, and Sudan. At a glance, that does seem to be the motif. It is being released during a high-profile event for an organization that seems to condone left-wing ideology (i.e. Colin Kaepernick) less than a week after Trump’s Muslim ban went into effect. But take a closer look at the advertisement. What if I told you that this is actually a pro-Trump ad? Yes, yes, it’s been beaten into our heads that Trump wants to lock America in its proverbial room and not let anyone in and that makes him Hitler apparently (a degradation that is now so common, it is devaluing the memory of Holocaust victims), and it’s really easy to say how much Trump is “anti-immigration,” but for some reason, it just can’t be beaten into the heads of liberals that there is a very discernible difference between “legal” and “illegal” immigration. This ad isn’t about looking the other way when Mexicans cross the desert and despite their clear violation of the law, calling them “otherwise law-abiding.” It’s about the right way to do things and the American dream. Busch, literally just off the boat from Germany, has an “Immigration Identification Card.” Apparently, he thought enough of his dream to brew affordable beer to make sure he came to America using the proper channels. 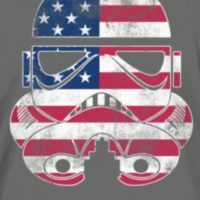 Yes, America. This is the proper way you immigrate to America. This is how you become part of the “fabric of who we are” – a term Ashton Kutcher used to describe people who won’t be moving into his neighborhood anytime soon. And let’s think like business people here. 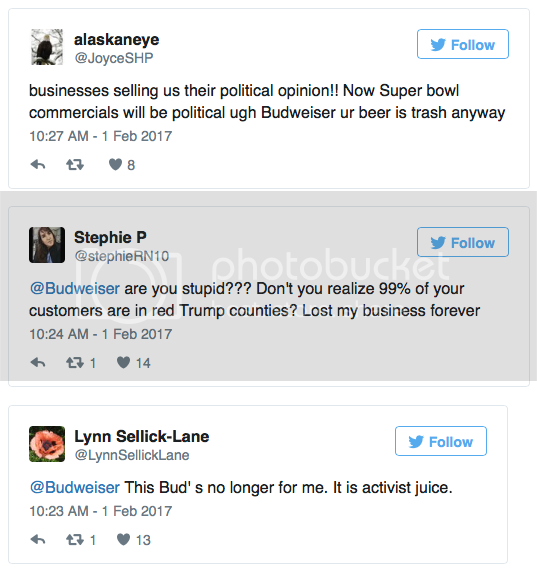 Would Anheuser Busch really provoke Trump supporters after pulling the plug on racist pot head Seth Rogan’s and future Spanish citizen Amy Schumer’s failed Bud Light advertising campaign? 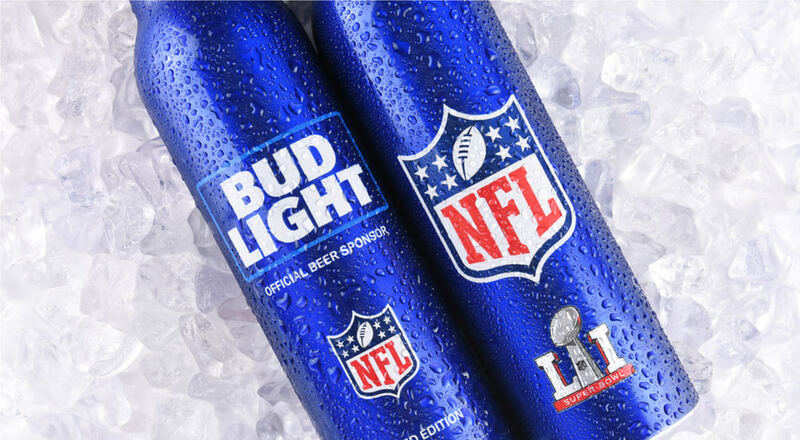 A campaign that was described as “very disappointing?” A campaign that hurt sales in Brazil and the US and forced Budweiser to re-adjust their earnings statement? I would like to think that a company that big is pretty self-aware, especially that closely removed from a fairly effective backlash. Not to mention this ad is fairly well-polished and there is no way it was thrown together in a week. The American Dream. Coming to the free world from a foreign country and working to achieve something great. If this was a dig at the politics of Donald Trump and his stance on a border wall, sanctuary cities, et al, it was a pretty bad one. Busch clearly had the paperwork required for legal entry into the county.